The Department of Planning, Transport and Infrastructure (DPTI) is upgrading approximately 34 kilometres of the road network between Palmer and Lobethal to enable South Australia’s Restricted Access Vehicle (RAV) network to be extended from the existing Adelaide Hills freight route. The project will provide a freight route, which can safely accommodate Higher Productivity Vehicles (HPV’s) up to 26.0 metre B‑double and Performance-Based Standards Level 2A (PBS L2A) heavy vehicle combinations. 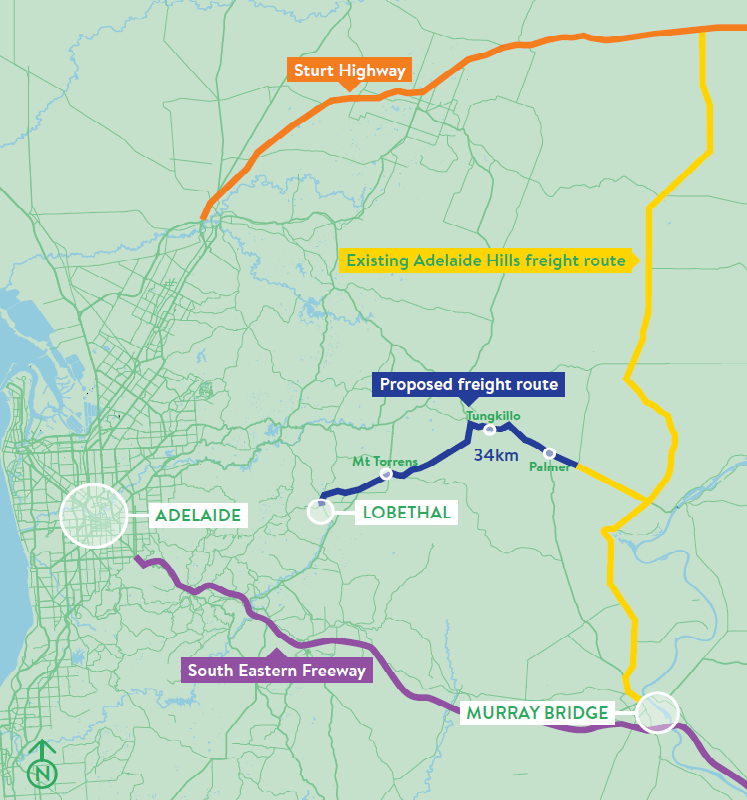 The freight route extends from Palmer, through Tungkillo and Mount Torrens to Lobethal via the existing arterial road network, being Randell Road, Terlinga Road, Onkaparinga Valley Road, Mount Torrens Road and Frick Street. Refer to Locality Plan for further detail. The provision of safe and efficient HPV access, including to the Lobethal area, was identified as a high priority in the 90 Day Project report A Modern Transport System for Agriculture. The 90 Day Project was a joint initiative of DPTI, Primary Industry and Regions SA (PIRSA), and Primary Producers SA (PPSA). The upgrade will improve safety, productivity and efficiency in the transport of goods via heavy vehicles to and from the Lobethal area. The investment is also expected to create employment opportunities for local industry by supporting economic growth and enhancing export competitiveness. The $14 million investment is funded by the Australian Government and will support around 55 full-time equivalent jobs during construction. Works on the Lobethal Freight Access Upgrade Project commenced Monday 17 September 2018 and works are expected to be completed in the third quarter of 2019, weather permitting. Road curve widening on Terlinga Road between the townships of Mount Torrens and Tungkillo and on Randell Road between Tungkillo and Palmer are currently underway. Upgrade works of existing culverts and bridge structures are in progress at four Bridge sites, with main works at Reedy Creek Bridge, Palmer completed. The National Heavy Vehicle Regulator has granted Conditional Permit Access with a range of safety conditions for B-double vehicles. This is to assist Thomas Foods International to maintain production and employment for hundreds of people following the fire at their Murray Bridge facility in January 2018. The Conditional Permit Access is being granted to provide assistance to Thomas Foods International and is not part of the Lobethal Freight Access Upgrade project. A map outlining the route to be used by vehicles with Conditional Permit Access is available above.